Lately, a Japanese-style park in HCM City's Hoc Mon District had been receiving a lot of attention in the media, so I struck out for a visit with a friend to see what the fuss was about. I thought it would be a sweaty motorbike ride but it was actually pretty pleasant. Taking Cong Hoa Street, we turned right on Truong Chinh Street, went straight to the Gieng Nuoc Intersection, and then took a left on Tran Van Muoi Street where there were many signs about the park, about 1.5km down the road. Although it covers only 2ha, the Tung Son Thach Park, located 20km away from HCM City's centre, has been a hit with tourists and Japanese who live in HCM City. Most of the materials used to build the park were imported from Japan. Japanese art forms including bonsai and stone sculpture works are on display, along with trees, rocks and fish raised in an outdoor pond. Open only a month, the park has already attracted Japanese tourists, a staff member of the park told us. The park is also known as Rin Rin, she explained, because the life character of the park owner Ngo Chanh and a Japanese artisan who served as a consultant is wood, under the five elements of Yin Yang. Rin means forest in Japanese. Fifty-six-year-old overseas Vietnamese Ngo Chanh, who has lived in Japan for more than 30 years, had dreamed of building such a park in Viet Nam for more than 25 years. Splashes of colour: Visitors watch the koi fish. Over the years, he has gathered materials, trees and stones from Japan for the VND400-billion (US$19 million) park, which was initially scheduled to cover 10ha. Construction took only seven months with 110 workers. At least 40,000 tonnes of stones and hundreds of centuries-old pine trees brought from Japan are the essential elements of the park. 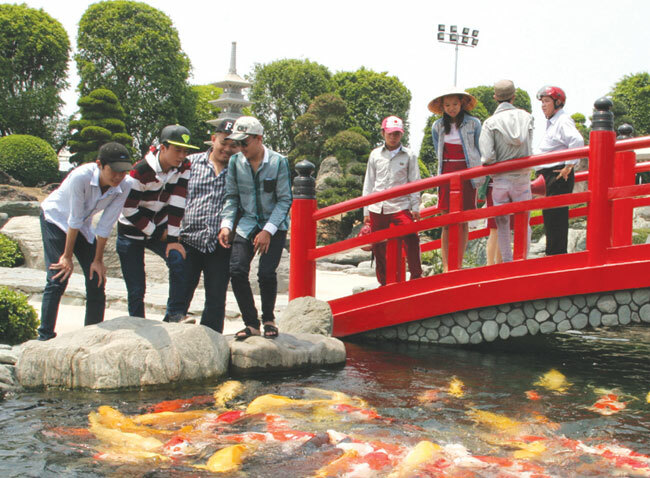 However, a water garden with more than 200 colourful koi fish, also called brocaded carp, brought from Ehime Province in Japan has attracted the most attention from visitors. The word koi comes from Japanese, meaning carp. It includes both the dull grey fish and the brightly coloured varieties. What are known as koi in English are referred to more specifically as nishikigoi in Japan, the staff told us. Varieties of the fish include Kohaku, Taisho Sanke, Showa Sanke, Butterfly koi, and Doitsu-goi. Although our group knew little about Japanese culture or language, we enjoyed sitting under the pine trees and watching the lovely fish, which were so friendly that we could reach out and touch them. However, the staff advised us not to feed or touch the fish for hygienic reasons. Aside from the koi fish, the park is a great place for bonsai lovers. Areas surrounding the pond are decorated with several pine trees 500 years old amid Japanese stones taken from a volcano. Along the entrance path to the park, there are 15 food stalls that sell Japanese food. Tasting Kobe beef or Ohini ice cream, Mochi, fish pie and seeing the Japanese-styled sites, you will feel transported to the land of Japan. 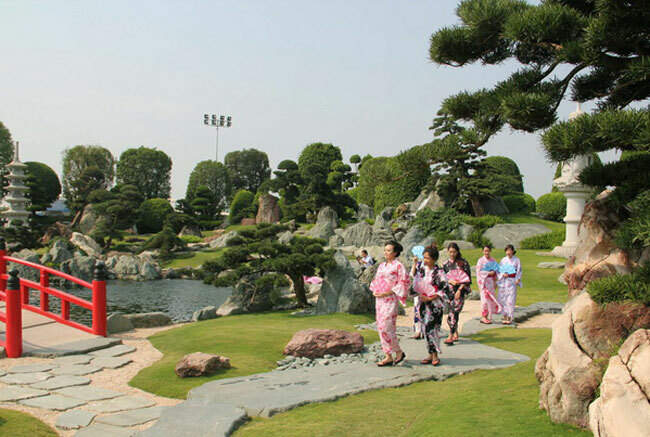 Kiyotaka Yamaoka, a Japanese man who has travelled around Viet Nam, said he had seen several similar parks in his country but he had not seen a nihon teien, which means Japanese garden in Viet Nam. "It's very beautiful park. I feel very happy to see a Japanese park built in Viet Nam," said Kiyotaka, after seeing some pictures of the park through internet. He added that he will be in Viet Nam in April and is eager to come and see the park. Though he has not been to the park, Kiyo said the garden is exactly the same with other nihon teien he has visited in his country after seeing photos featuring the park. Dao Van Chien, a calligrapher, who visited the park with his friends once, said upon visiting the park he was upset because it was so sunny. The trees and fish were very beautiful but the park's area was so small so he and his friends did not have many things to see there. "This is a good place but I felt uncomfortable seeing several staff using loudspeakers to remind visitors not to touch the fish, step on the grass and so on," Chien said. One local visitor said the park was not the same as what he had imagined and what he had heard from friends. "It took me only an hour to visit," he said. For me, the one item I wanted at the park was an umbrella as there were no tall trees for shade. The staff explained to us that tall trees were not a typical feature of Japanese parks.